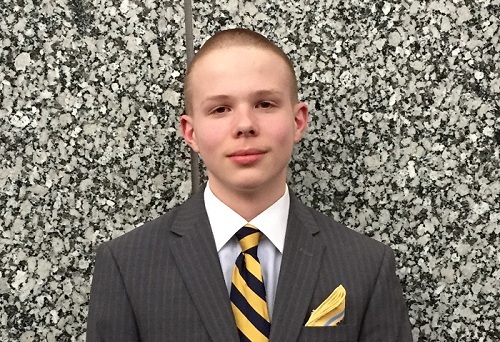 (Temecula, California) – Spencer Kinkelaar, a 16-year old honor roll student from Morrow, Ohio who enjoys collecting Franklin half dollars and silver American Eagle coins, has been selected as this year’s winner of the Professional Numismatists Guild Young Numismatist Scholarship. The scholarship will cover airfare and tuition for him to attend a week-long session of the 2016 American Numismatic Association Summer Seminar. Kinkelaar is one of triplet boys, and he credits his father with initially sparking an interest in coin collecting in all three boys. “As a young child, I was always interested in numismatics. At a young age, my father showed me his collection, which he started as a child,” Kinkelaar wrote in his application essay. Last summer, while he and his family were preparing to move from Philadelphia to the Cincinnati area, he rediscovered his old coin collection in the closet. “Remembering my past, I began to review my collection, excitedly noting my old pastime. I began to research collecting again and went to the bank to search half dollar rolls. Shortly afterwards, I joined the ANA as a YN,” he wrote. “We appreciate what the PNG is doing and the opportunity for Spencer. It’s a wonderful learning opportunity,” stated Mark Kinkelaar who has enjoyed going to coin shows with him. Spencer Kinkelaar will be a Junior this fall at Kings High School in Kings Mills, Ohio. His plans for college include studying economics and finance as an undergraduate, then attending business and law school for post-graduate degrees. The money to pay for the annual PNG YN Scholarship is administered from the PNG’s Gerald Bauman Memorial Fund. “Mr. Bauman served for many years as a prominent coin dealer with Manfra, Tordella & Brookes in New York City, and he was a mentor to some of today’s outstanding numismatic professionals. After he died in 2001, the memorial fund was created as an on-going legacy to him and his mentoring,” explained PNG Executive Director Robert Brueggeman. The Professional Numismatists Guild is a nonprofit organization composed of many of the top rare coin and paper money dealers in the United States and seven other countries. PNG member-dealers must adhere to a strict Code of Ethics in the buying and selling of numismatic merchandise. For additional information, visit online at www.PNGdealers.org or call (951) 587-8300.